Former NFL quarterback Boomer Esiason is the most visible national figure in the fight against cystic fibrosis, a life-threatening, genetic disease that affects the lungs and digestive systems of 30,000 children and adults in the United States. Throughout his career in professional sports and the media, Esiason has been a committed and active participant in many charitable causes, but he began focusing on cystic fibrosis in 1993 when his son, Gunnar, was diagnosed with the disease. In 1994, Esiason launched the Boomer Esiason Foundation, a dynamic partnership of leaders in the medical and business communities joining with a committed core of volunteers to heighten awareness, education and quality of life for those affected by cystic fibrosis, while providing financial support to research aimed at finding a cure. Since its inception, the Boomer Esiason Foundation has raised more than $150 million to support research toward a cure for CF, as well as programs directly benefiting the CF community. As the median age of survival for CF patients has increased to more than 40, and many are living well into their adult years, Esiason has turned his focus to bridging the gap between pediatric and adult CF care. The Boomer Esiason Foundation has led the charge to create state-of-the-art facilities for those adults afflicted with the disease. This effort began when the Foundation granted Columbia University Medical Center $6 million to establish the Gunnar Esiason Adult Cystic Fibrosis and Lung Program—a top adult CF care center that opened doors in 2009. Esiason and his Foundation have also instituted several educational, awareness and compliance programs aimed at the adult CF population. Esiason continues to attack the disease head-on and helps bring CF to the forefront of policy discussions throughout the country. He has traveled to Capitol Hill on multiple occasions and to various states to speak on behalf of the CF community. After an All-America career at the University of Maryland, Esiason enjoyed a 14-year career in the NFL as a quarterback for the Cincinnati Bengals, New York Jets and Arizona Cardinals. He became a four-time Pro Bowl quarterback and one of the most successful quarterbacks in NFL history, including being named the NFL’s Most Valuable Player in 1988. Esiason ended his career with 2,969 completions in 5,205 pass attempts (57 percent completion percentage) for 247 touchdowns and 37,920 yards. In 1995, the NFL honored Esiason with the Walter Payton Man of the Year Award in recognition of his excellence on the football field as well as his charitable work through the Boomer Esiason Foundation and other organizations. Upon retiring from the NFL after the 1997 season, Esiason headed straight for the broadcast booth. He made his debut as a commentator for ABC’s NFL “Monday Night Football” and called “MNF” games for two years. For nearly a two decade called games for Westwood One/CBS Radio Sports’ “Monday Night Football” broadcasts with Marv Albert, Howard David, Dave Sims and Kevin Harlan. 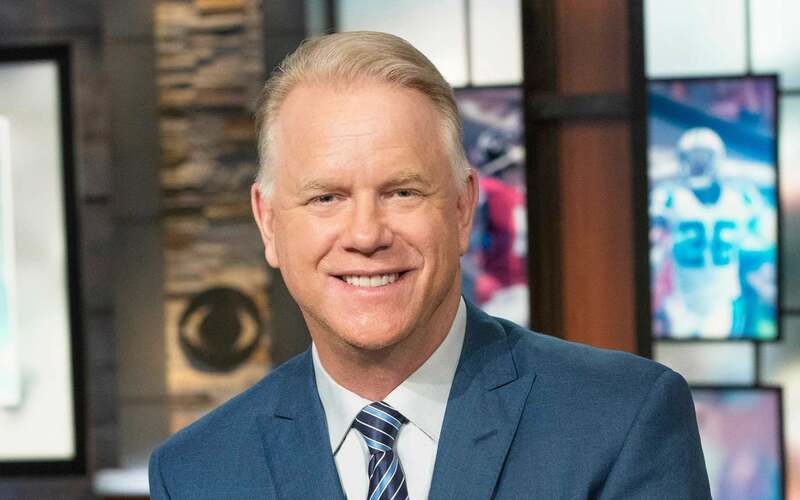 Esiason joined CBS Sports in 2002 as a studio analyst for “The NFL Today,” the CBS television network’s NFL pregame show. He is also an analyst on Showtime’s “Inside the NFL.” In 2007, Esiason debuted as host of WFAN’s national weekday morning radio show, “Boomer and Carton in the Morning.” He also hosted “The Boomer Esiason Show” on Madison Square Garden Network. Esiason is currently co-host of the “Boomer and Gio in the Morning” radio show.